Back in 1987 I was working in the 3rd Armored Division G-2 shop in Frankfurt, Germany, and had recently been the first person to model the then new T-80B and T-80BV tanks. But now we were getting pictures of a rather odd vehicle moving into East Germany under tarps that was the size of a large self-propelled artillery piece with a very bulky turret. I was asked if I could also model this new vehicle and I agreed once we could figure out what it was and what it did. It soon became apparent that this was the legendary "ZSU-X" which had appeared in the Pentagon's "Soviet Military Power" annual reports for several years. 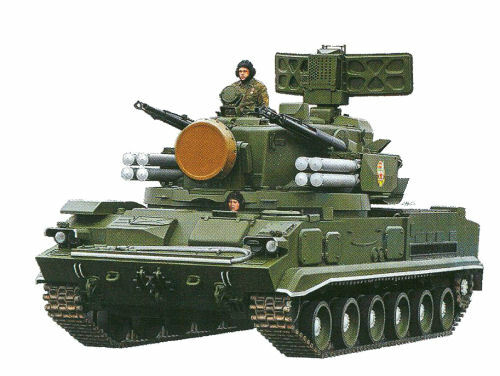 But whereas that had supposed this was using a T-72 chassis, the visible parts showed it to be using a Tomashov designed chassis related to the SA-4 GANEF and 2S3 "Akatsiya" howitzer. We finally got some clearer photos and I went to work. We had problems figuring out how many guns it had – two were visible but wear marks on the canvas showed four muzzles, two per side. We could also see what looked like four missile tubes. Reports soon indicated it was dubbed "Tunguska" (a river in Siberia) and did use both missiles and 30mm cannon. It had a target acquisition radar like the SA-8 that popped up in the back and a fire control radar on the front of its turret. We also found out it had a suspension that could be dropped down to 10 cm for stability when firing and using the search radar for more precision. The Soviets finally paraded the vehicle, and we found out it was dubbed the 2S6. Armament consisted of two 2A38 twin-barreled 30mm guns and four 9M311 "Treugol'nik" missiles. The later, full production 2S6M variant then added four more for eight missiles onboard. I did scratchbuild the model and USAREUR made an unclassified training poster of it just before I left Germany in 1989. The Tunguska is a very impressive vehicle, as it is fully computer controlled and will select missiles, guns/missiles, or guns as it deems necessary to eliminate threats. It uses a velocity sensor on the outside barrel to determine shell velocity and correct for it using the fire control radar. The guns are fired in 20-40 rounds (5-10 rounds per barrel) bursts and are very powerful, with the cyclic rate being so high flames from still burning propellant shoot about a meter out of the shell ejection ports when it fires. The missile has two stages – a very high acceleration first stage and an unpowered second stage that continues to the target on inertia at very high velocities of over Mach 2.5. There have been a few resin kits of this vehicle produced up until now but were complex and difficult to assemble at best and impossible at worst. Now Panda, another of what seems to be an unending stream of new model companies coming from China, has produced a kit of the main production variant, the 2S6M. This is a new mold kit as there is nothing that it could be based upon, and Panda has done a nice job of it. This is a very complex kit and rivals the DML Tiger I kits for sheer number of parts. The price is high – I managed to get this one for $60 at AMPS 2013 and lower prices are seen on the Internet – but that is the cost of today's super-detailed kits with etched brass and single link tracks. The kit has some options but setting the suspension height is not one of them. The suspension units (parts D21-25-27-28) are keyed so the road wheel arms will only attach at the proper movement angle. The tracks will be a bit of a pain as each link consists of a pad and a separate delicate tooth for it. All of the hull hatches are separate parts but Panda does not offer any interior or any directions as to which is which. The turbine APU exhaust hatch (parts A37-B28-B73/74) can be either closed for movement or open for operation (it produces about 18 kilowatts of power for the electronic systems). The turbine intake (part A38) and others have etched brass grilles for them. The turret consists of three main parts (AA, BB, CC) and are the base for all the remaining details. Each of the 2A38 cannon consists of 17 parts each with the velocity sensors taking six of those (parts B81, C40/41 and D13) with another 21 for the elevating mount. Many of the eentsy parts go on the guns and radar, so be prepared to use a lot of patience on them. The 9M311 missile containers are much simpler and only take 16 parts each (times eight). Note that each side of the turret is assembled separately and takes six steps in the directions. There are another 23 parts to the HOT SHOT search radar and it is quite detailed. The two Treugol'nik (triangle) missiles are provided for display but cannot be used as part of the model without major surgery to the launch tubes as they are sealed units. One finishing option is provided for a simple protective green vehicle with Guards badges and white trim, but these vehicles are often seen with three-color camouflage and 6xx side numbers in tank and motorized rifle divisions (now brigades). A set of decals is provided with a "number jungle" for the bort numbers and also the Guards badges. Overall this is a very complex kit but will build up to an accurate model of a 2S6M as in service today.